To the uninitiated twenty-first century observer, the dots may seem like a minor artistic embellishment used on a quaint periodical from half a century ago. In actuality these little dots were a kind of minor revolution; a technique employed by a master artist that showcases his total understanding of the limitations of 1960s printing presses and the four color process. While most comic artists of the day were content to depict explosions and cosmic energy with flat colors and lazy zigzag lines, this artist understood that when drawing such astonishing things there could be – and should be – equally astonishing layers of texture and density. In his hands explosions rippled off the page and cosmic energy seemed to undulate in waves. 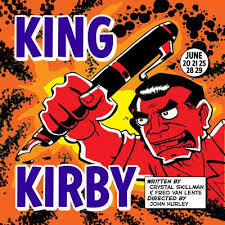 I’m so glad I got to see King Kirby at The Brick’s Comic Book Theater Festival last week, and not just because husband and wife playwrights Fred Van Lente and Crystal Skillman have so completely captured the essence of the seminal comic artist Jack Kirby in their brisk docudrama. Crammed into the sold-out Brick along with a veritable who’s who of Indie Theater, I found the event of the play to be something of a minor revolution itself; a much-needed reminder of the importance of artistic genius and the even more important charge of protecting genius that cannot protect itself. Born Jack Kurtzberg, a rough and tumble kid raised on the (then) mean streets of New York’s Lower East Side, Kirby changed his name (“so it’d sound less Jewish”) but never really shook off his working class roots. From his startlingly inventive work to his protracted conflicts with the publishers of his comics, his meteoric career and somewhat sad fate loom large over the history of comics, an industry infamous in its infancy for shortchanging its best talent. 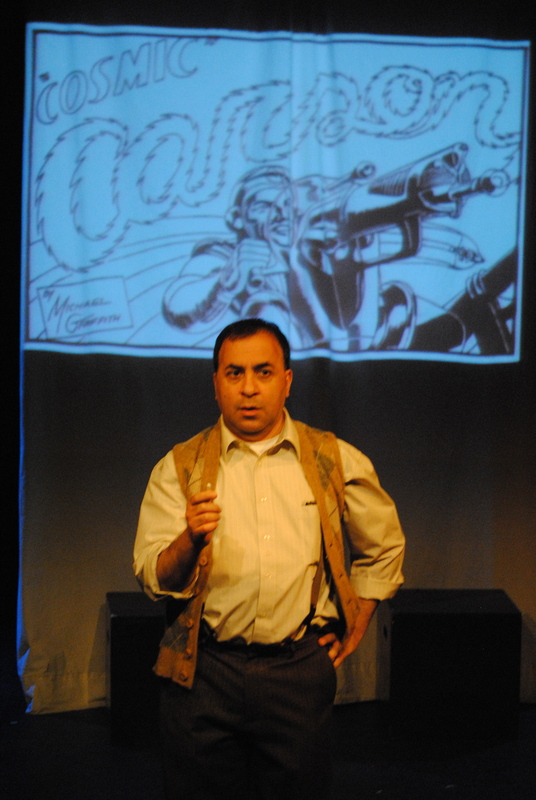 Skillman and Van Lente could not have picked a better moment for this theatrical biography: super heroes are currently bringing in box office dollars in the billions and litigation between Kirby’s estate and the companies who own the copyrights to the characters he drew is currently being considered for review by the Supreme Court. It would seem that if ever there would be a posthumous moment for an airtight staged appreciation of Kirby, this is it. As a long time comics guy, I’m very familiar with Mr. Van Lente’s work and have enjoyed his comics for years. I particularly liked M.O.D.O.K.’s 11, a fun team-up comic featuring a bunch of third-rate super villains. While I am embarrassingly not familiar with his Action Philosophers series with Ryan Dunlevy, I loved their documentary series The Comic Book History of Comics, which chronicles the trajectory of the comic industry from its inception to the present day. On top of being a talented guy, he’s clearly one for doing his homework. I know his wife, Ms. Skillman, from a fascinating play of hers that I saw at The Brick a few years back called The Vigil or the Guided Cradle. I respected that play for its willingness to dive so fully into the world of obscure medieval torture devices, and also because it offset the grim subject matter with a number of very affecting human moments. Ms. Skillman is a prolific playwright in the Indie Theater circle, and I while I have somehow missed out on all of them, I have been happy to see her successes with plays like Geek!, Cut, and her stage adaptation of Action Philosophers in last years Comic Book Theater Festival. Van Lente and Skillman bring their combined aptitudes for history and comedy to bear skillfully in King Kirby, which hits all the key facts of Kirby’s work and personal life in 75 minutes but doesn’t forget to slow down for a few deeply felt scenes. 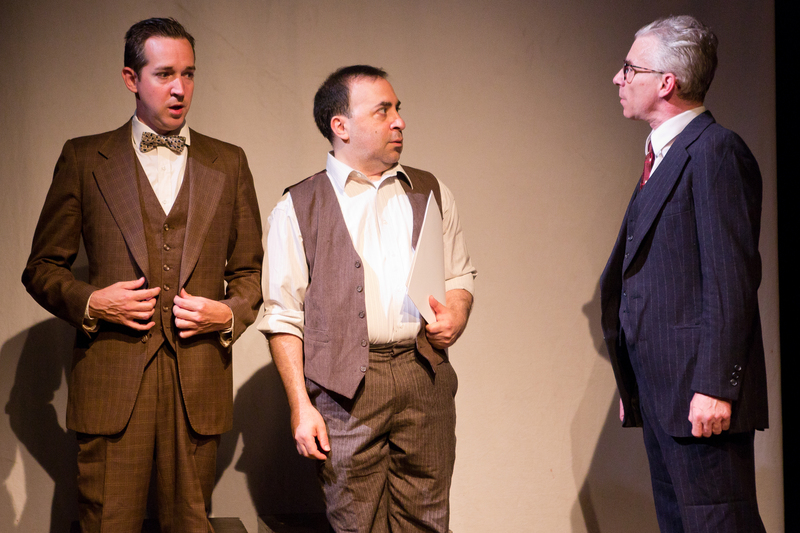 Aided by John Hurley’s snappy staging, the playwrights have done a terrific job in curating moments from Kirby’s life that help communicate the larger context of his story. Case in point, the play begins with a scene at a 1994 Sotheby’s auction, where a clueless auctioneer is selling off Kirby’s original artwork soon after his death. “Even if this isn’t ‘art’ in the traditional sense,” she says after confusing Spider-Man for Iron Man, “it is a valuable piece of Americana.” Just before she starts the bidding, Kirby, who has been lingering in the scene like a ghost, stops her. “Nothing’s worse than hearing what you’re worth after you’re gone,” he says. All it takes is this brief prologue for Skillman and Van Lente to establish the thematic framework of the story; in minutes Kirby’s insecurities, the general ignorance and under appreciation of comics, and the fraught relationship between money and art are already on the table. That the cover of the playbill for King Kirby has been designed to mimic the Sotheby’s auction program is an exquisite final touch. With all the parameters set with such great economy, the rest of the play has the freedom to zip along or take it’s time as needed. As Joe Simon, Kirby’s Golden Age collaborator and friend, the genial Joseph Mathers helps to show how Kirby and his work benefited from having someone looking out for him. But Simon grew weary of the comics industry, and ultimately left Kirby to fend with the big bosses on his own. It’s clear that Timothy McCowan Reynolds gets to have the most fun in the play, cycling hilariously from one publisher or authority figure to the next. 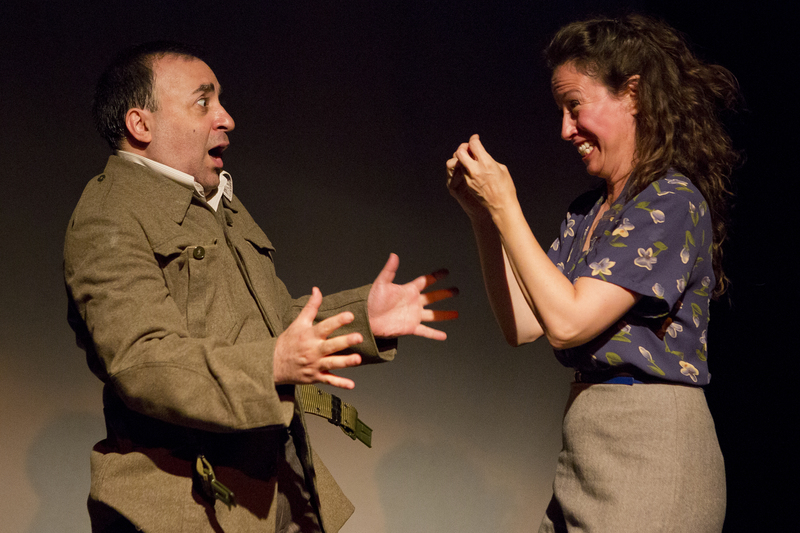 His brief turns as a belligerent General Patton and Italian director Federico Fellini are pretty remarkable. 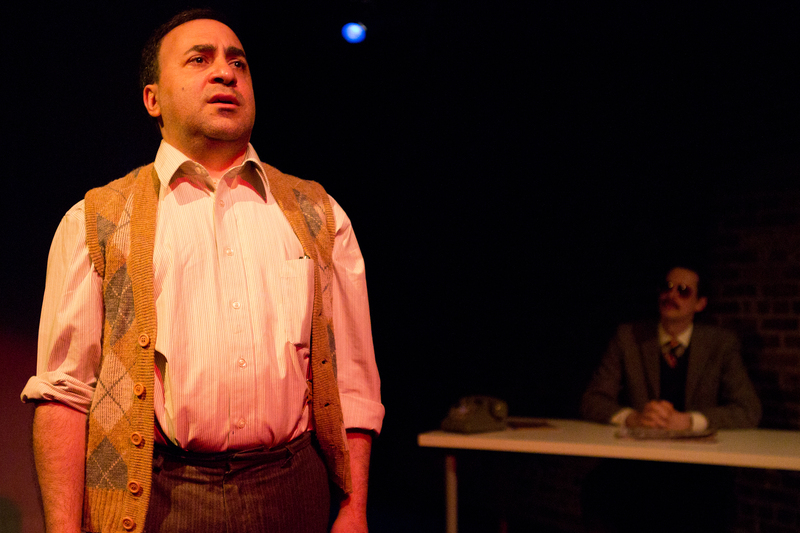 That the play locates Kirby as a working class underdog among these big personalities is no surprise; that it also carefully lays out the character traits that prevented him from becoming a top dog gives the play a sense of balance I honestly didn’t expect. 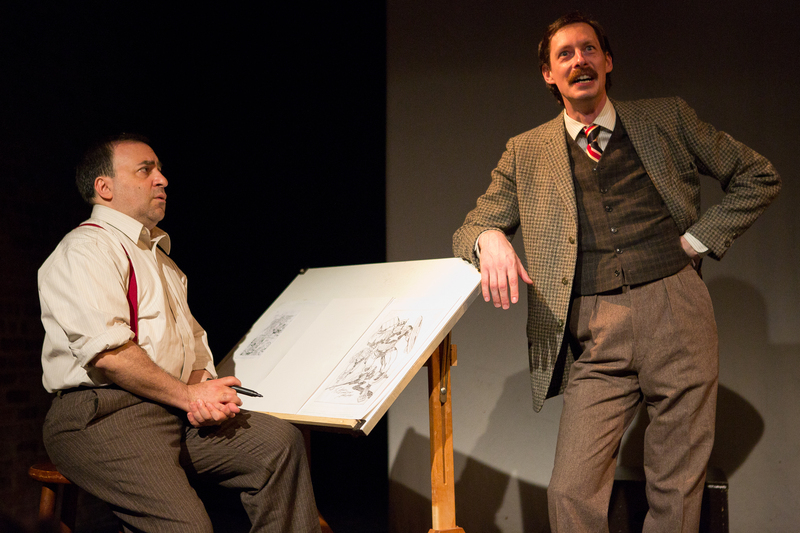 Sure, he occasionally entertains an idle fantasy of writing the comics he draws, but throughout the play we see Kirby continually refuse to pursue greater financial and career success, as his friend and Captain America co-creator Simon often does. 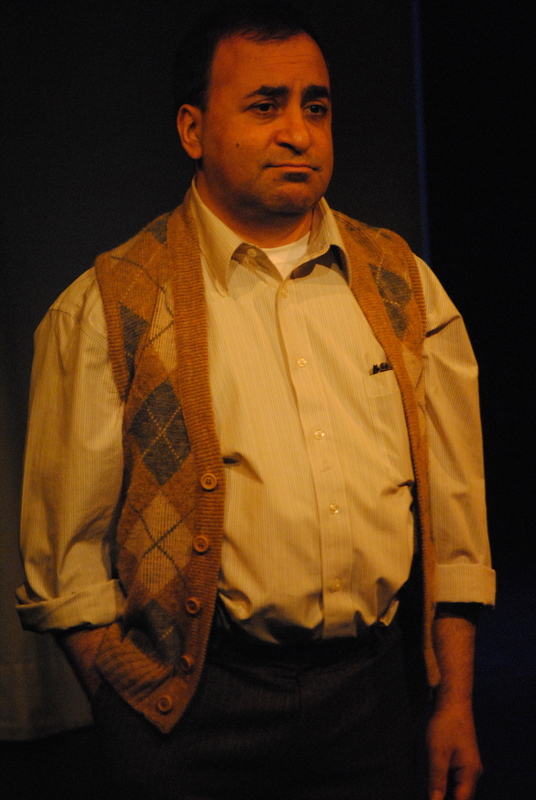 As portrayed by Rattazzi, the sometimes hangdog Kirby operates under the all too blue collar notion that asking for more money might rock the boat and, subsequently, lead to less work. And the work is something he values deeply. “The work is magic,” he frequently says, even when prevailing opinion says that the genius of all the comics he drew originated elsewhere. The world believed that elsewhere to be Stan Lee, a.k.a. Stanley Lieber, who started out as an office boy for Kirby and Simon when they were at Timely Comics in the forties. After Kirby and Simon left Timely, Lieber, then only 17 years old, dug in his heals at the company, which was published by his cousin, Martin Goodman. He served as editor in chief and wrote essentially all the comics the company produced. By the early sixties, when Kirby came back looking for work, Lieber had reinvented the company as Marvel Comics and himself as Stan Lee. He and Kirby collaborated on the comics that introduced iconic characters like the Fantastic Four, Iron Man, the Avengers, and the X-Men. The parameters of that collaboration have always been at the heart of the debate over Kirby, who allegedly would plot out and draw an entire comic from just a one sentence pitch from Lee. As Sean Howe points out in his enlightening book Marvel Comics: The Untold Story, Lee was not just a co-creator, he was also the management. While Kirby and other artists lingered in relative obscurity, the showman Lee took great pains to ensure his own ubiquitousness and financial appointment – often, many allege, at the expense of others. People want magic. Not because they’re innocent little children at heart but because the world is a whirlwind of crazy and magic is a simple way to make sense of it all. A genius — me — dictates his ideas to talented craftspeople — you — and the result is love and riches. I am not qualified or knowledgeable enough on the particulars to persuasively argue either Lee or Kirby as the central “genius” of those beloved comics. I can say that I feel strongly that to whatever extent the genius flowed, it came from both directions. The “love and riches” Lee mentions, however, did not. They say that history is written by the winners, but I say that history is just lazy. 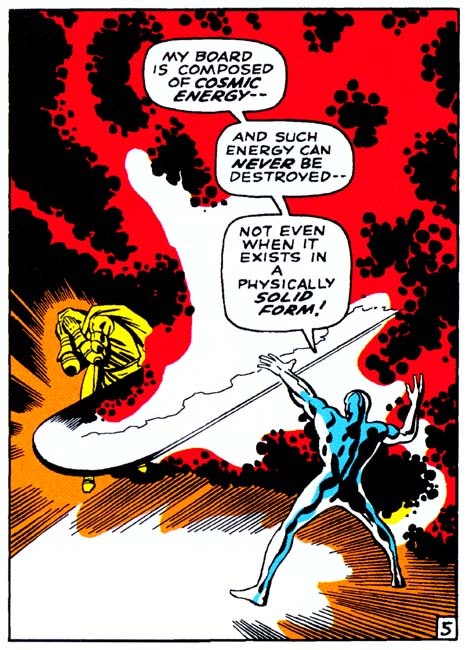 The work that came out of Lee and Kirby was beautiful; whiz-bang sensationalism with a kind of bespoke purity. And because the work was pure, people tend to gloss over its complicated origins; origins more complicated than our legal system can negotiate, apparently. What is clear, is that of these two guys, one of them is still doing pretty well for himself and one died with very little to his name. You don’t have to be an expert on “work-for-hire” or contract law to sympathize with that. For this reason, I view Skillman and Van Lente’s King Kirby as a cautionary tale reminding us of how infrequently the meek actually inherit the Earth. It feels wrong to describe the legendary dynamo Jack Kirby as meek, but Skillman and Van Lente have crafted a compelling portrait of a brilliant man who often accepted enough when he so clearly deserved more. For an artist who constructed such lush far-flung imaginary places and fantastical futures, Kirby the man remained firmly cemented in the here and now. There was his wife and there were his four kids and there was the work that supported them. He never wanted to make waves. But soon enough there were waves being made by others, and Kirby, like so many hired artists throughout history, found himself pulled off with the tide. Too often are the brilliant taken advantage of by the merely cunning. For those of us adjacent to great minds in any field, there also comes great responsibility. It must fall to us to help take care of the gifted among us; to ensure that they are forever cherished and properly supported for their ability to fill our drab world with sparks of color and krackles of light. Presented by The Brick Theater as part of the Comic Book Theater Festival.